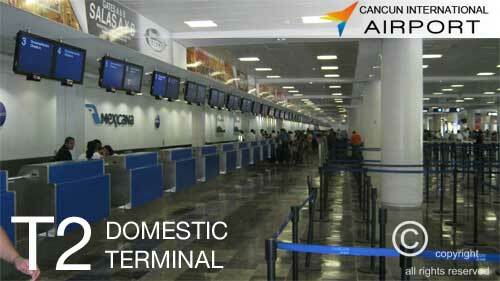 Cancun airport is the second largest airport in the country. Receiving thousands of tourists to enjoy this beautiful Mexican Paradise. At Terminal 2 aircraft generally are National and International Charters has 2 outputs to your arrival, depending on the airline Terminal will indicate that. You can wrap your luggage with the special plastic that will not damage your luggage and belongings are safer. (Secure Wrap) You have to deposit the specified amount to the machine for the service. You will find lockers service, but small belongings to leave, you cannot store large luggage. We recommend you identify your luggage for optimize your time at delivery bands, will be more comfortable for you if your luggage has wheels so the displacement, will be agile. If is possible get a combination lock for your luggage, will be better. If you have hand baggage, keep it with you. Take it all the time and check that is closed so as not to leave any of his belongings and no unpleasant surprises. If you find baggage or someone forgot something, DO NOT TOUCH, report it immediately to the authorities, they are able to return to the hands of their owners. It is very important to take into account these recommendations for their comfort and safety. For passengers who require specia l care, we have the wheelchair service to move the facilities of the airport, just as we have access (ramps or elevators) throughout the airport and bathrooms for their ease and comfort, your airline crew will tell you how to enter the aircraft safely. If required, we have medical service and security 24 hrs. The airline Mexicana and Aeromexico has a waiting room for its VIP customers but if you are not traveling with any of these airlines can get for $35 usd per person to the waiting room VIP Lounge, where you will have massage chairs, drinks, Snacks, TV, unlimited internet access, bathroom, wardrobe, and all the amenities to await their flight. Children are admitted free accompanied by an adult.